What is the UK Drought Portal? The UK Drought Portal is a tool to help visualise the current meteorological drought status across the UK, and to put the current situation in a long-term context. The Drought Portal was first launched in July 2015, allowing users to explore and understand the severity and magnitude of drought at different spatial scales across the UK over a 50-year period from 1961-2012. We've now relaunched the Drought Portal as a near-real-time tool. As of May 2017 the Portal is now updated at the start of each month to include data for the previous month. For example, in early July 2017 the Portal will be updated to include data for June 2017. This allows users to explore up-to-date data and monitor the current dry weather status across the UK. Why have we produced it? We have produced the Portal primarily as a near-real-time tool to aid the monitoring and early warning of drought and as a way of allowing users to explore past drought characteristics in an area of interest. There are many other sources of information that can be used for drought monitoring, notably the Hydrological Summaries produced by the National Hydrological Monitoring Programme, the Water Situation Reports produced by the Environment Agency and similar products developed by Natural Resources Wales (NRW) and the Scottish Environment Protection Agency (SEPA). These publications are still the main mechanism for tracking and interpreting current hydrological status of the UK. Compared to these publications, however, the Portal offers a more interactive environment. 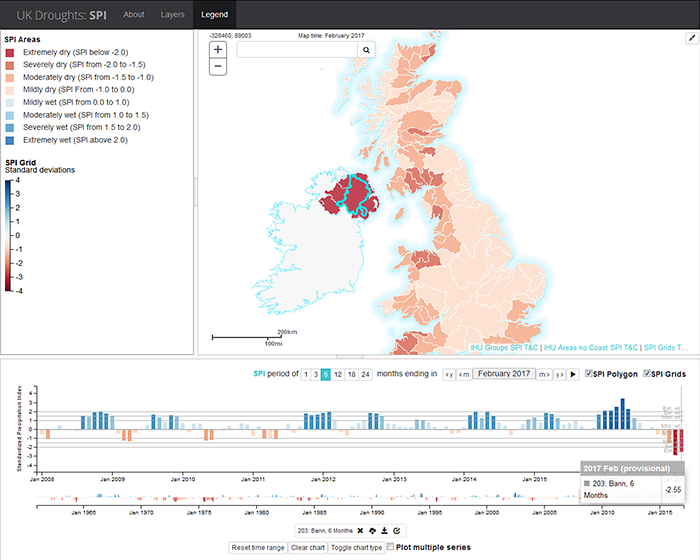 Whereas the Hydrological Summaries are released as static PDFs, the Portal is a website that allows users to explore drought dynamically using mapping and time series plotting tools to view locations and timescales of interest. In addition to viewing data for the current month, users can plot historical time series and maps back to 1961. Similarly, the Portal allows users to explore more localised and customised information than the selection of catchments and regions presented in the Hydrological Summaries. The Portal shows rainfall for regions covering the entire UK across a range of spatial scales. In addition, a 5km resolution grid allows users to explore drought at a higher resolution than with existing information. However, it is important to note the gridded data are subject to some uncertainties given the underlying raingauge dataset, as discussed on the Portal description. Although it is aimed primarily at drought monitoring at present, the Portal can also be used to assess water status more generally. In particular, it can also show when conditions are very wet and there is a heightened vulnerability to flooding. Who is the UK Drought Portal for? Anyone with an interest in current drought status. We envisage this would include a wide range of people involved in water management, e.g. water supply companies, policymakers, regulators, consultants, academics, farmers and growers, businesses (particularly those which are heavily dependent on water abstractions) and power companies. Given the interactive nature of the Portal and the capacity to explore data on a localised scale, we also hope the Drought Portal provides a useful dataset for the media and the wider public. EA, NRW and SEPA have regulatory and operational duties to plan, respond and manage dry weather and drought incidents in order to mitigate their impacts on people and the environment. While we anticipate that the Portal provides useful information to support assessment of drought conditions for a broad range of users, it is important to note that it is currently based on one indicator (rainfall) and therefore does not provide a full picture of drought status or impacts, as considered by the various regulators who have particular triggers and terminology used to declare drought status. The drought indicator datasets on the Portal have been developed through work on several NERC-funded drought projects, DrIVER and Historic Droughts. Much analysis has been undertaken in these projects to test the utility of drought indicators for indexing drought severity in the UK. DrIVER has been exploring the development of improved monitoring and early warning in the UK, and internationally, and has carried out engagement activities with a range of stakeholders who have provided feedback on the Portal – for more information please see here. The Portal is currently a tool for exploring meteorological drought using a precipitation-based indicator which is derived from the UK Met Office NCIC 5km gridded product. Information is shown using the Standardized Precipitation Index (SPI) – an indicator of drought that is widely used internationally and is recommended by the World Meteorological Organisation for meteorological drought monitoring. The SPI normalises rainfall deficits (typically calculated over a range of timescales: the last month, three months, six months, the last year, and so on) using historical data for the location of interest (in our case each region or grid cell). This means the current situation is expressed relative to the past range of variability for the place in question. The ability to consistently compare deficits in precipitation over both time and space is particularly important, as droughts occur in all regions, including areas that are generally known for being wet. Drought should be defined in relative terms, i.e. as below normal water availability for the time of year for the place in question. On this basis, the SPI allows consistent comparisons between localities with very different rainfall regimes (comparing, say, a wet catchment in upland Scotland with a dry catchment in low-lying East Anglia). The SPI also allows comparisons between different seasons. 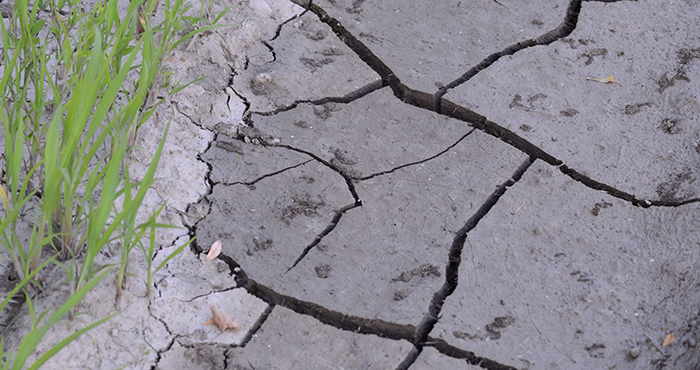 While droughts are often thought of as a summer phenomenon, they can occur at any time. In the UK, rainfall deficiencies in winter are important as they result in less recharge of groundwater and less replenishment of reservoirs. Further information about the SPI is provided in the references provided at the end. What is the future of the Drought Portal? There are a number of other developments planned for release over the next 12-18 months. The current Portal is based on a single rainfall indicator (SPI). The same types of standardised indicators can be derived for other variables of the hydrological cycle such as river flows and groundwater. Using all three in combination will allow the hydrological situation to be monitored comprehensively in this standardised, comparable way. Standardized Precipitation and Evapotranspiration Index (SPEI; Vicente-Serrano et al, 2010) based on the difference between rainfall and evapotranspiration. This means that evaporative losses (which can be very important in drought episodes) are accounted for and may be of particular interest for water resource managers and farmers. Standardized Streamflow Index (SSI; see Barker et al, 2016). Standardized Groundwater Index (SGI; in collaboration with our colleagues in BGS; see Bloomfield et al, 2013). The Standardized Streamflow Index (SSI) is already being produced monthly, using a formulation we have developed and tested for the UK (Barker et al. 2016; Svensson et al. 2017). We plan to add SSI data for catchments used in the Hydrological Summaries to the Portal the near future. An example of the current SSI maps are shown below. In future, the Portal could also be expanded to incorporate information from other sources which could be useful for drought monitoring and early warning, such as Cosmos-UK or Earth Observation products, or the range of hydrological models we currently use at CEH. What is the recent hydrological situation (June 2017)? The Drought Portal (currently displaying data to the end of May) shows that May was moderately wetter than average in much of south-east England and parts of Wales and southern Scotland, but dry elsewhere, particularly in parts of north-east Britain. The spring as a whole (SPI3) was notably dry in north-east Scotland, with the SPI3 for the Scottish Dee reaching lower than -1.5 (‘severely dry’) and all but coastal areas in Wales, north-west England/south-west Scotland and northern Scotland were drier than normal. More notable deficits can be seen over the last six months (SPI6), the winter and spring combined. Over this period it was dry across the UK, particularly across the far south of England, parts of north-east England and in Northern Ireland; for several regions in Northern Ireland, the SPI6 is lower than -2 (‘extremely dry’), last seen in the mid-1990s – the recent spell has seen a cluster of the lowest SPIs on record here. For some of these regions (southern England, parts of central Scotland and Northern Ireland) the last year as a whole has also seen moderately to extremely dry conditions (as characterised by the SPI). As mentioned above, the SSI is being calculated each month, although the data are not yet shown on the Drought Portal. The maps below show the monthly SSI for the past 12 months, for catchments used in the monthly Hydrological Summaries. For May you can see ‘severely dry’ conditions in catchments in eastern Scotland and northern England reflecting the SPI shown on the Drought Portal. Some catchments in these regions registered SSI values in the top five driest Mays – the Dee at Woodend (Scotland) and the Tyne at Bywell (north-east England) recorded the third driest and driest May, in records since 1929 and 1956, respectively. Catchments in the south-east of England are shown to be in moderately dry condition in contrast to the SPI (showing ‘mildly wet’ across much of south-east England), reflecting the delayed response of river flows due to the influence of groundwater in this region. When the May SSI is compared to SPI accumulated over three and six months the source of these river flow deficits is much clearer. Looking at the SSIs for each month over the past year, river flow deficits can be traced back to summer 2016. The dryness of much of the last year is also confirmed by the other situation monitoring tools released by CEH: the Hydrological Summaries, Hydrological Outlooks and COSMOS-UK. There has been some subtantial rainfall in June since the latest updates of these products. The Portal will be updated in the first few days of July, while in the second week of July we will produce another blog post providing a water situation update to the end of June using all of these information services including the Portal. For further information and updates, please come back and visit the portal in early July. Updates will in future be added in the first few days of each month. For enquiries about the Drought Portal or the current hydrological situation please contact the National Hydrological Monitoring Programme. World Meteorological Organization (WMO) and Global Water Partnership (GWP), 2016: Handbook of Drought Indicators and Indices (M Svoboda and B A Fuchs). Integrated Drought Management Programme (IDMP), Integrated Drought Management Tools and Guidelines Series 2. Geneva. T B McKee, N J Doesken and J Kleist (1993). The relationship of drought frequency and duration to time scales. Proceedings of the 8th Conference on Applied Climatology, American Meteorological Society Boston, MA, USA. Vicente-Serrano, S M, Begueria, S, Lopez-Moreno, J I. 2010. A Multiscalar drought index sensitive to global warming: the Standardized Precipitation Evapotranspiration Index. Journal of Climate, 23, 1696 – 1718. L J Barker, J Hannaford, A Chiverton and C Svensson (2016). From meteorological to hydrological drought using standardised indicators. Hydrology and Earth Systems Science. 20(6): 2483-2505. Svensson, Cecilia; Hannaford, Jamie; Prosdocimi, Ilaria. 2017 Statistical distributions for monthly aggregations of precipitation and streamflow in drought indicator applications. Water Resources Research, 53 (2). 999-1018.